Well-designed experiences influence behavior. A well-designed customer experience can influence customers to return for additional purchases, spend more money during each purchase, and tell lots of other potential customers about the experiences they’ve had with your business, etc… In addition, a well-designed customer experience can influence customer behavior in a way that decreases the cost of service. For example, the experience can be designed to increase the likelihood the customer will place an order or look for service on the web rather than calling the call center. Additionally, I’m doing an increasing amount of work with energy companies who traditionally haven’t paid much attention to customer experience. However, many of those companies are now focused on designing services and experiences that influence customers’ conservation and consumption behavior. …small and seemingly insignificant contextual details have a major impact on people’s behavior. …How Including an Irrelevant Choice Can Influence Customers to Spend More? The presence of an irrelevant option influenced a more than 250% increase in customers choosing the more expensive alternative!!! Ariely observed the following, “Thinking is difficult and sometimes unpleasant.” Cues that allow us to establish the relative value of various offerings, then, reduce the cognitive load or effort required to think about your options. 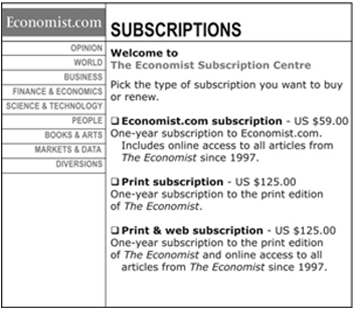 What the Economist offered was a no-brainer; while we can’t be certain that the print subscription is worth more than twice the electronic version, the combination of the two was clearly worth more that the print version alone. Let’s look at a simple illustrative case. 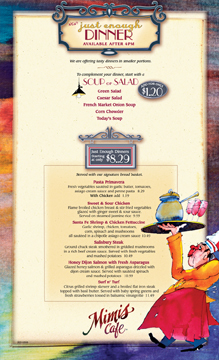 A well-designed restaurant menu can be a great example of choice architecture based on sophisticated menu psychology. It turns out that there is a predictable Visual Choice Pathway people typically follow when they read a menu. For example, when most people open a four page menu, their eyes go first to the top of the page on the right side. A smart menu designer generally places one of the highest profitability items at the top of this page. Then, most people’s eyes will move down towards the center of that same page. An even smart(er) menu designer will put the most expensive item towards the center of the page… not because they think the customer will order it… but because it will tend to prime the customers’ expectations about what they’re likely to spend. 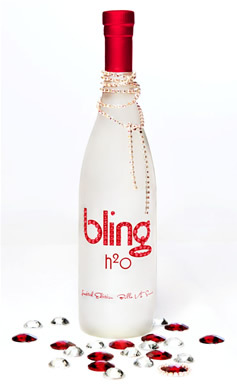 In most cases, customers will then look at the items immediately above and below the most expensive item. Those two items immediately above and below the most expensive item are deliberately two of the most compelling selections on the menu… and are the most commonly ordered items designed to generate the most profit on the menu. There have been numerous examples of restaurants that have been able to significantly shift their average ticket size based on the design of the menu. (See: Reading Between the Lines: The Psychology of Menu Design or Basics of Menu Psychology). A similar thing happens in high end retail boutiques. The sight of those $295 jeans (I still can’t believe it!) subtly prime the customer to feel that $125 jeans are a bargain. The $295 jeans sell a lot more $125 jeans. We’ve seen the same sort of thing in jewelry stores, hospitality companies, and many other diverse situations. The design of an election ballot is an example of choice architecture. Experiments have shown, if a candidate is listed first on the ballot, he may well get a 4% increase in votes. When a doctor describes alternative treatments available to a patient, it is also an example of choice architecture. Research has shown that if a doctor says 90% of patients are alive five years after a certain procedure, far more people opt for that procedure than if the doctor says 10% of patients are dead five years after having it. Unfortunately, most companies don’t think about choice architecture effectively… actually in most cases, they don’t think about it at all. Often a company will just throw a bunch of alternatives at their customers and count on the customers to sort it out. As a result, they miss significant opportunities to drive additional revenue and profit. The most important starting place is to understand much clearer how customers make decisions and design an experience that fits the way customers think (i.e., Design from the Mental Model of the Customer). See: Optimizing the Most Critical Elements of the Customer Experience: Customer Choices and Cognitive Ergonomics: Framing and Priming the Customer Experience. If we want to increase savings by employees, employers might … enroll them automatically in a 401k plan, unless they specifically choose otherwise. If we want to increase the supply of transplant organs in the United States, we could assume that people want to donate, rather than treating non-donation as the default. If we want to increase charitable giving, we could give people the opportunity to join a plan, in which some percentage of their future wage increases are automatically given to charities. If we want to respond to the recent problems in the credit markets, we could design disclosure policies that ensure consumers can see exactly what they are paying and make easy comparisons amongst their possible options. Default Design. Whatever you chose as the default option has the highest likelihood of being selected. For example, the states that have organ donation as the default option when individuals get a drivers license have a much higher acceptance rate. In fast food restaurants, highly profitable combo meals have become the default option… customers often need to explicitly ask for just the burger. Design architects need to pay careful attention to the default option. Anticipating Errors. People make mistakes and it’s possible to design a choice architecture which anticipates these mistakes and thus leads to better outcomes. Thaler and Sunstein have been promoting the example of “Save More Tomorrow” programs, which help employees set aside future pay hikes for retirement. “Save More Tomorrow is based on the same principle of expecting error,” he said. “We ask people if they want to commit now to saving more later, because all of us have more self-control in the future. The first company that adopted it tripled savings rates, and the program is now spreading.” They also use the example of the Paris subway card, which allows users to insert it into an electronic turnstile in any of four ways to gain entrance to the subway. Compared that to most payment kiosks in which there are 4 possible ways to insert your credit card… only one of which will work. …you are almost certainly missing significant opportunities to improve profitability.